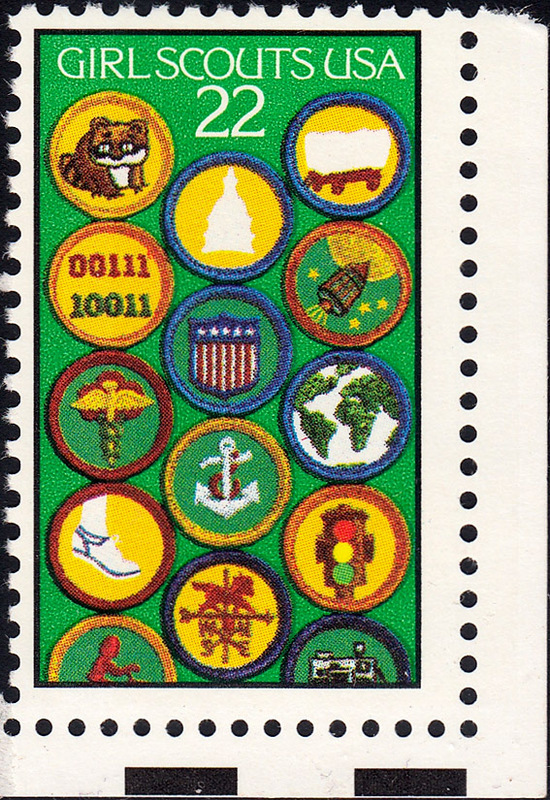 The U.S. issue honoring the 75th Anniversary of Girl Scouting, #2251, March 12, 1987 had several printing errors. This is one of only two major catalog recognized errors for this U.S. 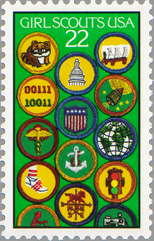 Scout stamp. This error [#2251a] was created when all the offset lithographed colors of black, yellow, magenta, cyan and green were omitted. The two intaglia colors (red and black) are all that were printed. Only one partial sheet is known to exist. In the second major error [#2251b], the two engraved colors (red and black) were not printed. This leaves all of the lithographed colors in place, an exact opposite of #2251a. Put these two errors together and you have the as intended issue. This printing variety is the result of excessive green ink from the offset printing cylinder which totally covers the narrow white letters and smears the edges of the badges. This variety known as the "Black Bracket" and "Horseshoe" variety are the same thing now that an entire sheet was available for study. 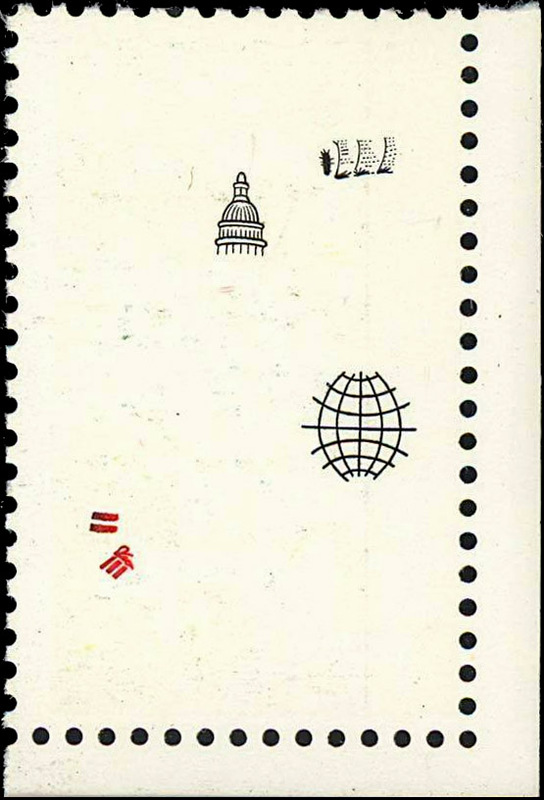 Two passes through the press were required for this issue...one for the offset multicolors and the other for the minor intaglio printing of the black lines on the Capitol, the black lines on the globe and the black lines on the running shoe. Sheets that had not been fully dried were damaged in running through the intaglio press...the heat melted some of the earlier applied colors, and deposited excess ink in the bottom half of the stamp...this excess ink can be as small as a large comma and as you go from left to right, the deposits grow larger and appear as a dark black horseshoe. 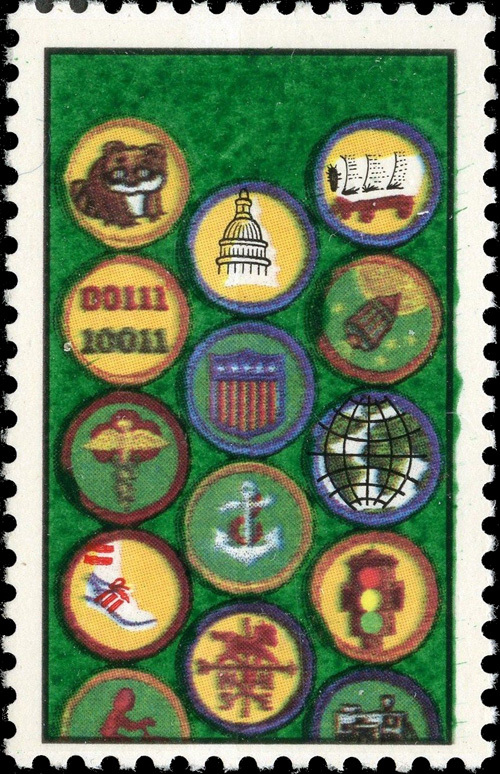 The black ink deposits exist on perhaps 30 of the 50 stamps. Furthermore, on the same sheet, the far left two or three vertical rows also show the black intaglio lines missing on the running shoe...so the lines that are still there are RED....a partial missing color. View entire sheet of ink smear Sloppy wiping by Press Operator, creates this massive Ink Smear.